I didn’t get a great picture of the carrot cake my Grandma made, but if you look to the left of this picture you can see it. And trust me when I say it’s the best carrot cake I’ve ever had. Mix above ingredients well, then add carrots and mix again. Place in greased dish 9 x 13, not floured. Bake 350 oven 30 -35 min. Mix above ingredients until smooth. Add powdered sugar, enough so frosting is thick and easy to spread. Add ½ tsp vanilla. I must say, the frosting is what makes it so so good! 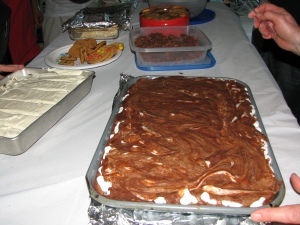 I mentioned to my Grandma that it tasted more like a spice cake than a carrot cake, but I still loved it! QUESTION: Do you have a family recipe that always turns out great? 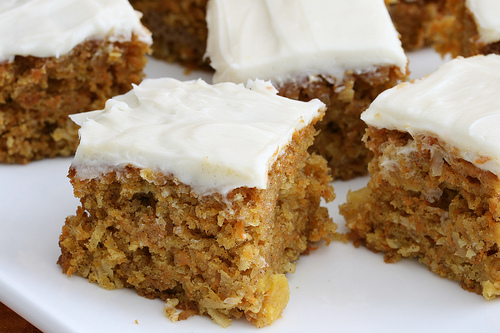 Oh my gosh I ADORE carrot cake! You have me drooling right now! You said soda? is that baking soda?